← WHAT IS SKILLED MOVEMENT FOR BABIES ? SIZE: Choose a play mat that is large in size so that as her motor skill of locomotion develop, such as rolling and crawling, she will have plenty of space to move and explore. Some mats, such as the one in the above photo, are created with interlocking pieces of foam. This allows you to expand the size of the mat as baby’s motor skills develop. For the first three months baby’s motor skills such as kicking occur without traveling in space. Soon, however, she learns to roll and needs more space. PORTABILITY: Do you like to go to the park, beach, or overnight visit to grandma and grandpa’s house? Some play mats fold up easily for babies on the go. Travel styles include play mats made from interlocking foam pieces, quilts and blankets that are easily foldable and lightweight, and mats that roll up into a carry bag. 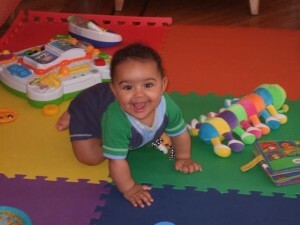 EASY TO CLEAN: A play mat should be easily cleaned with a non-toxic cleaner or readily laundered in the washing machine. Part of maintaining a “green” home includes regular cleaning to remove dust that contains toxic particles. NON-TOXIC: Baby will spend hours on her play mat, so choose one made of non-toxic materials such as a cotton quilt. Remember that the skin is one of our largest organs and baby’s skin will be close to the mat for hours every day. Toxic baby products made of plastic may off-gas harmful chemicals for baby’s developing system and it is recommended to avoid them. Two cotton quilts placed one on top of the other works quite well as a natural option. Remember to bring your body down onto the play mat as well so you can be at eye-level with baby. If she can see your face when she learns to lift her head it will be a wonderful reward! This entry was posted in PRODUCTS & GEAR and tagged 3-6 months, 6-9 months, locomotion, play. Bookmark the permalink.